Former Danish Royal Ballet dancer and contemporary filmmaker Alexander Kølpin is set to open Sanders, Copenhagen’s first luxury lifestyle hotel, this September. Located in the heart of Copenhagen’s historic and cultural centre, minutes away from the picturesque canal Nyhavn, the royal residence Amalienborg Castle, and dozens of contemporary art galleries, the hotel joins a tranquil residential neighbourhood steeped in local history and atmosphere. Created by Kølpin, the 5-star, 54-guestroom property is based within a classical Jugendstil building, dating back to 1869. Sanders will provide a charismatic and dynamic meeting place for hotel guests as well as Copenhagen’s cultured and creative community, offering a comfortable and inspiring home from home. 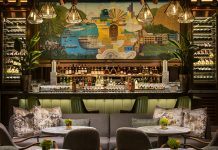 The hotel will draw on cultural and colonial influences with richly textured lounge areas featuring rattan ceilings and Murano glass chandeliers. 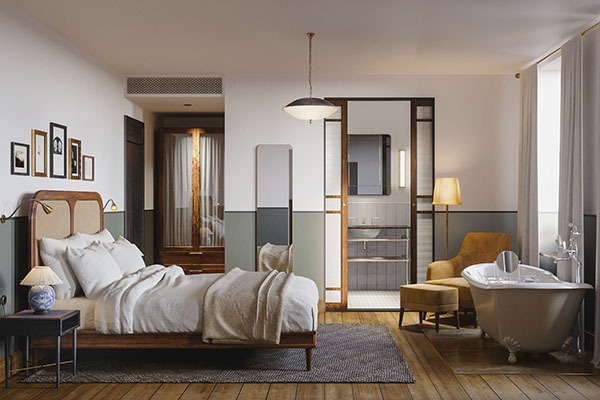 Guestrooms are inspired by luxury train cabins and range from single Coupe bedrooms to apartment suites, whilst additional facilities include the Sanders Kitchen; the TATA cocktail bar; the Living Room and an inner courtyard for casual dining and drinks; as well as a rooftop conservatory, open from breakfast until nightfall. Older Paris – whose founders have collaborated with Alexander McQueen and Isabel Marant – will design the bespoke uniforms. Køplin has worked with London-based design duo, Lind + Almond to realise his eclectic aesthetic for the interiors, which fuses classic mid-modern Danish features with English eccentricities and Asian influences. 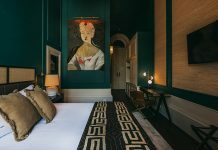 Further, a selection of emerging British artists has been commissioned by UK-based arts consultancy Dais Contemporary to create exclusive artwork throughout the hotel. The lobby will form the heart of the project, with wood burning fireplaces, freestanding bookcases, rattan cane-couches, leather safari chairs and a Murano-glass chandelier salvaged from Brick Lane market, all set against handmade Jute wallpaper and dusty golden undertones. The Sanders Kitchen will be reminiscent of a bustling European cafe with bespoke cement tiles and aged timber, serving simple cuisine sourced from seasonal Danish producers and local winemakers. Elsewhere, the decadent Tata cocktail bar will provide a day to evening hangout, lined with burnt ochre velvet curtains, a midnight blue snug, black slate floors and vintage mirrored bar. 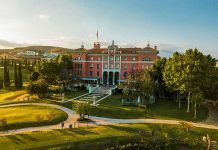 Sanders will be the third offering within the Kølpin Group, following beachside hotels Helenekilde Badehotel and Tisvildeleje Strandhotel, both situated in the North of Denmark.